The project Art, collections and data across borders will work on the common goals of two national insitutions - Slovak National Gallery and Nasjonalmuseet (The National Museum of Art, Architecture and Design) - to open up the collections to the public and to implement the digital technologies into fabric of their organisations. 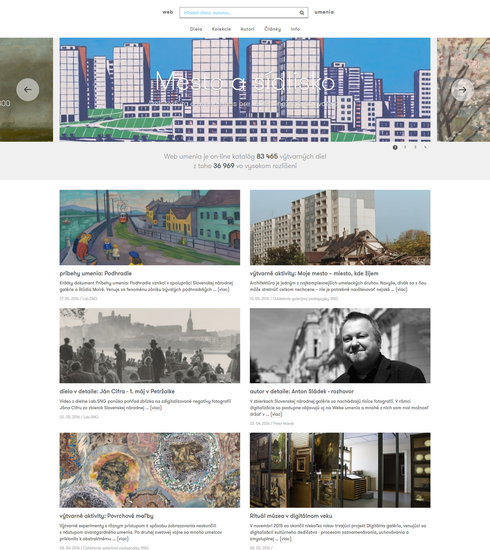 Slovak National Gallery (SNG) maintains a collection management system CEDVU used by all state registered art museums (galleries) and develops an online catalogue www.webumenia.sk ("web of art"), currently publishing collections only from some of the art museums. 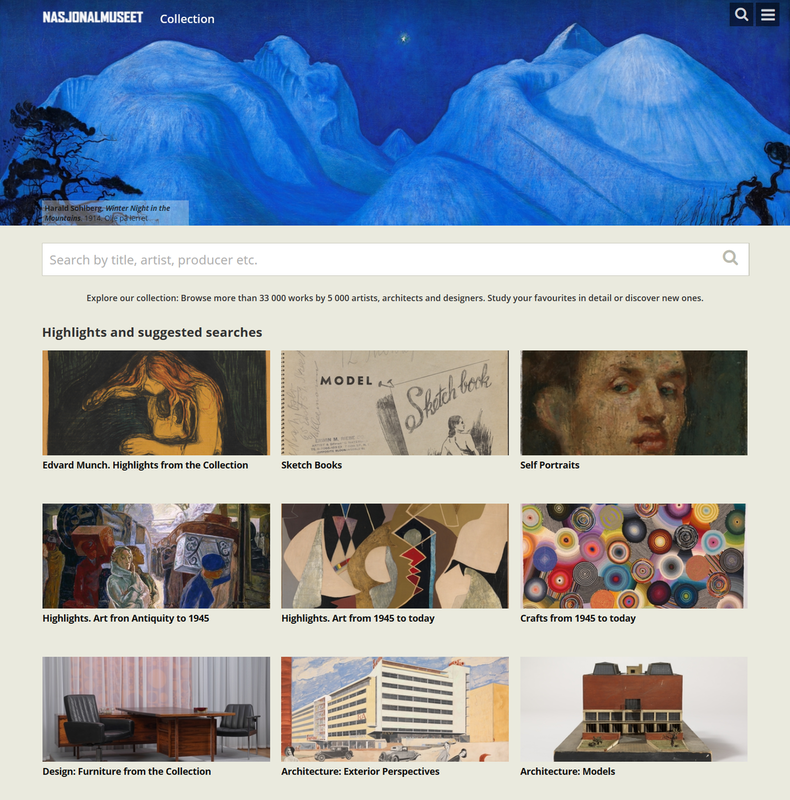 Nasjonalmuseet is working on a similar project samling.nasjonalmuseet.no, currently a prototype for publishing art collection data online, with plans to provide it to other Norwegian museums. This similar approach reflects the fact that the smaller museums in both countries lack internal capacities and funds to publish their collections online themselves and rely on a shared platform, such as Web umenia or Samling. Both projects are developed in-house, use open source components, publish their code as open source and release the images with open licenses when it is possible. SNG has been working on a digitisation project in recent years, where large parts of art museums collections have been digitised in high quality. The need to upgrade the existing and technologically outdated online catalogue arose, as the quality of the images offered more possibilities than just simple search and browse options. lab.SNG has been established - a platform to research and develop digital technologies in the museum field and as a "vehicle" for digital transformation of the institution, which corresponds with the long-awaited main building reconstruction. Nasjonalmuseet has plans for a new museum building and as part of the process, it is working on a "digital lab". The digital lab is in an early phase, and SNG's experiences with the lab format will be useful for Nasjonalmuseet. This common ground of both institutions offers the possibility of knowledge and skills exchange, sharing of technologies and outlining a similar digital strategy. An international partnership is a vital component for implementing the digital technologies into the fabric of the institutions and helping the smaller museums along the way. Experts from partnering institutions can offer outside view and knowledge in order to move forward with implementing the digital technologies into the daily life of their organisations. This will help the overall goal of opening up the collections to the public, as the digital technologies and internet become one of the main contact points alongside the physical visit. holds, preserves, exhibits, and promotes public knowledge about, Norway's most extensive collections of art, architecture and design. It shows permanent exhibitions of works from its own collections and temporary exhibitions that incorporate works loaned from elsewhere. The Museum's exhibition venues in Oslo are the National Gallery, the Museum of Contemporary Art, the National Museum – Architecture, and the Museum of Decorative Arts and Design. The Museum's programme also includes exhibitions that tour both within and beyond Norway's borders. The project is supported by Norway, Island and Lichtenstein in the framework of the EEA Financial Mechanism and the state budget of the Slovak Republic. Programmers, collection management specialists and management members from both institutions will meet during two workshops (one in Slovakia and one in Norway), presenting and developing common objectives and best practices for Samling and Web umenia, discussing their plans for digital transformation of the institutions. The process and result will be documented on the project website. Ad-hoc meetings will be held online. Both projects (Samling and Web umenia) will work together on customisation of open source tools such as OpenSeaDragon for viewing high-resolution images. Samling has implemented a functionality which allows to pull the artist biographies from linked open data and Wikipedia, which Web umenia plans to implement also and will benefit from Nasjonalmuseet experience. Underlying concepts leading the development of the websites will be discussed, further development in directions where both projects overlap will be identified during the workshops. Both institutions' projects expect to enlarge the number of participating art museums as a result of the project – better functionality and overall service of the online catalogues will be convincing for them to participate and present their collections online. Public event “SK/NO Art Data Hackathon” will involve public presentation of the outcomes and will make a call to artists and programmers from both countries to take the data and images from collections and reuse them in new ways, artistic or web-wise. The lab.SNG has already organized a Hackathon (inviting designers, programmers and artists to reuse Slovak National Gallery data and code), the Nasjonalmuseet on the other side has experience with new ways of presenting the collections data with the Repcol project. For the event, the participants will be students and young people who are already involved in graphic design, programming, arts or digital media. In respect to the time table this event is planned for October 2016.